Just couldn’t get into this one. 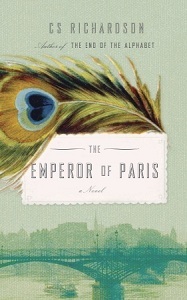 From the reviews I’d read, it sounded like The Emperor of Paris was a slow start for most, but if hung on to long enough would pay off. Not for me. Too many characters within a jumbled chronology made for a terribly hard read, one I found extremely hard to focus on long enough to really get into. I get the feeling that a second read would really change my perspective on this novel, but for now there are far too many other books I need to get to! I will say however that C.S. Richardson has a wonderful way with words; his work might benefit from a much more linear story. This entry was posted in Book Reviews and tagged Book Reviews, C.S.Richardson, Fiction. Bookmark the permalink.